(CNS): Despite increasing the price of cigarettes and banning smoking from all indoor public places, the health minister said that Caymanians are still smoking hard. As a result, given the serious health implications for smokers, Osbourne Bodden has said it may be time to consider whether the Cayman Islands should become an entirely smoke-free environment. Speaking in the wake of the recent national healthcare conference, the minister said that since the price and the ban has not stopped people, government may have to take “some bold steps” and there may come a time when it will be “completely banned." This year’s conference focused on chronic non-communicable diseases, which, like the rest of the western world, are a significant problem in Cayman. Smoking is just one of the risk factors that are causing people to die far sooner than they should and to suffer debilitating illness before they die. As well as smoking, Caymanians are increasingly obese and sedentary. People do not eat enough fruit and vegetables and statistics show that alcohol misuse is another major health risk that is making people very ill. He said that hypertension, which can cause strokes or heart attacks, is the most common complaint treated at the Cayman Islands Hospital, followed by diabetes. Diseases of the circulatory system are the most common cause of death here in Cayman, the minister explained, followed by cancer, external causes, diseases of the respiratory system and then conditions affecting the endocrine system, as well as nutritional and metabolic diseases. “Perhaps even more of a cause for concern, the studies highlighted the fact that far too many of our children are overweight or obese,” he warned. Pointing out that the trend cannot be allowed to continue, he said the conference was about seeking ways to prevent Cayman's adult and youth populations from developing CNCDs. “CNCDs are diseases that are often preventable and because of this we are encouraging people to take charge of their lives, and learn about how to live a healthy lifestyle,” he added. 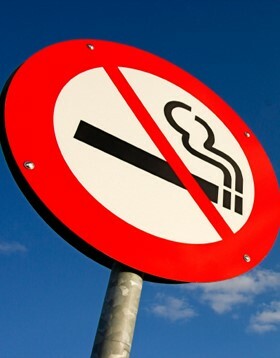 CNS Poll: Should there be a blanket ban on smoking in Cayman? Lmao!!! This is a good one! Is it Aprils fools day already? Is this the crap that we pay those guys to sit around and come up with? What an excellent idea !!! (not) and while we're at it – let's put a ban on burglary and robbery and drug dealing and the like !! We'd have about the same chance of stopping those things happening once the Laws were passed (ooops – they already were) !! About as useful an idea as a Chocolate Teapot ! Well, since fumes from our Motor Vehicles are bad for the Health, let's Ban the importation of Gasoline for our cars and boats and Utilitiy Station uses !! I do think some of the posters need to be a bit careful when pointing the finger at 'obese' people – Not all obese people are that way through overeating – sometimes it's a medical condition, slow metabolism, thyroid gland not working etc. You only need to Google the problem and you'll see some people can eat nothing more than a lettuce leaf but just continue to put on lbs. As for obese people as a result of stuffing themselves with McDonalds etc…. well fair comment !! At least ALL smokers have a choice !! Oh, by the way – might be interesting to get a count of how many of the Ministers Politician friends and colleagues are smokers….. bet he has their vote eh? As an ex-smoker myself, I'm not saying I now approve of the habit but like one of the other Posters said – they can't even enforce the laws currently in place – not much in sense in introducing more !! If you have a slow metabolism, etc then eat less, it is not rocket science. you cannot beat the laws of thermodynamics, food eaten = energy in, basal metabolic rate + exercise = energy used. If the food in is greater than the energy used, you will eventually become obese. And no people are not just eating letcue and getting fat, they would die first from lack of nutrition. 09:55 What a simplistic way of thinking you have ! – Not everything in this world is so 'black and white as you would try to paint it , except perhaps in yours – otherwise we probably wouldn't have the problem of smoking at all- you could just tell people to stop and they would…..but the problem (or solution) is not that simple. You purposely ignored the word Thyroid in my post. Hypothyroidism is an affliction which causes varying degrees of weight fluctuation and is not simply as easily governed by eating more or less ! There are many other diseases and afflications which have a huge influence over weight gain or loss regardless of the amount the person eats – take AIDS or cancer for instance – a lot of people lose a tremendous amount of weight – that's not necessarily because they are eating less food. There are many everyday prescription Medications which cause excessive weight gain/loss – this has nothing to do with how much a person eats …but they may 'have' to continue to take them in order to live…. come on now…..
And for your information, there is a well know case where a man ate mostly just lettuce for the best part of a year and lost half his body weight and went on to live a quite healthy life…..and yes, in his case – he was morbidly obese but …..many people can eat extremely small diets and still gain weight (exercise or not)…. As I said in my original post – I'm not trying to make excuses for the otherwise healthy who are morbidly obese because they eat a loaf of bread and a Dozen eggs with a Pound of Bacon for breakfast – yes those are cases where eating less and excercising would reduce their weight……….. I'm just saying there are some people who unfortunately can eat very little and still gain weight excessively…It's a FACT ! 22:00 thanks for your post. Many people are ignorant to what persons sufering from Hypothyroidism go through. It is new to me and I gained well over 30lbls in the last 6 months, and have struggled greatly with my enegy levels. But being in tune with my body I knew something had to be wrong so I went to the doctor for a check up and that was when I found out my thyroid functions had pretty my hit rock bottom. All my life until a few years ago, I have been super active and represented Cayman nationally in various sports. Naturally I slowed down due to age but still kept fit and played sports though at a less intense level due to knee surgery. But I was still able to maintain a weight up until March this year within what is said to be my range medically, and a weight range more than blanced for my height. Luckily due to an attentive doctor and my being proactive, I have since been able to increase my thyroid levels albeit only a little, but they are far from back to normal. My energy levels have increased thank God which aids greatly with my exercise. I work out at least 5 days per week and still have not lost any weight and this is on top of eating barely anything to compensate. I am also seeing a nutritionist so I educate myself on all the foods good for the thyroid function as this would be best in the long run. Also to aid me in hopes of losing weight. People see me in the supermarket and call me fat now because I have been very skinny all my life. It's extremely sad when people make assumptions about me as I am sure is the case with other people and they don't have a clue what is taking place in my or these other people lives. While generally people look like how they eat, in some cases that is not the case. I am not, and have never been, a lazy person and certainly do not wish to become one now, using this ailment as an excuse. My plans are to continue to seek help and keep active doing the best I can. Also I thank God it's not something worst that I have been diagnosed with. Before judging people who are over weight, gently remind yourself that while you may know the person you don't always know their story. 2:37 sorry to hear your battle and I wish you every success in your healing process. You are right – too many people judge too quickly…… I can understand it with kids – they often know no better – (guilty myself, when I was a kid ) but I'd like to think that when we have grown up, we think before we point the finger or make some cruel comment that is totally not asked for. I'm first to comment (even if only to my spouse) when someone is deliberately harming themselves (with food or whatever) – like the Obese couple I saw on a Cruiseship…..piling their plates High as anything just because the food was included in the price – it was a horrible sight to see them 'snaffling' it down ! but let's face it…. they wake up in the morning and look in the mirror just the same as I do – they can plainly see what is looking back at them so what is the desperate need that some people have to remind them. What are you going to do – 'shoot them' or 'ban them to Mount Trashmore and lock the gate ' ?? By all means let's educate the obese and 'getting obeser' ( I know, probably no such word) kids from wolfing down Fast Food every chance they get but let's not assume that every one of them is fat because of their eating habits. poster # 2.37 could be your brother, your sister or your spouse…..
Great Idea (from ex smoker). Let's create a new contraband called black market cigarrettes, create a whole new class of criminals, underground smokers, (becasuse if he think banning cigarettes will get smokers to quit, he's a babbling moron). The fine and filled our jails will illegal smokers..
What's next? Alcohol? Why don't we ban cholesterol while we are at it, and make it mandatory to excercise regularly of face jail time? Why not… let's have a government ran "public feeding station" so all of us can go there and placed of a coveyor belt and fed intreveneously by some govenment worker, the precicely correct amout of calories and nutrients. How incredibly, mind boggling stupid can one be. ozzy here is the solution…..
ban smoking in all public places includes outside bar areas, beaches…etc. increase the price of cigarettes to $25/pack…..
just stop waaffling on about 'complete smoking bans' that you and the hopeless ppm will never intorduce…..
Get real! Over the years Governments have changed so many laws and practices to suit tourists, eg we shouldn't expect our visitors to go a a restaurant unless they can have liquor as well, we must extend the opening hours of bars to enhance the visitor experience. We have given away so much,! We now gonna expect visitors to come to a place where they can't smoke! Why don't you ban liquor? Alcohol has ruined millions of lives and drunk drivers have killed innocent people, at least the smokers now only harming themselves. I wonder how many politicians and other top civil servants who owns various businesses throughout the Cayman Islands – are selling cigarettes left, right and centre to the general public; and are so happy with their large profits ? Thank God I'm a non-smoker. The man too frightened to open a dump in Bodden Town because it may offend voters in his district is going to ban a legal drug a large number of voters are addicted to! Yeah, that's going to happen. Ossie wasn't frightened, he just had enough sense to understand the meaning of being a representative of those who voted for him in Bodden Town. As for the previous incumbents, they were the frightened ones, and look what happened to them, they got booted out. Yes says the obese minister of health who seldom misses happy hour. Why not do something about the dump, that is the greatest threat to the nations health. Unfortunately that is also the greatest threat to your reelection chances, so we know what your priorities are. Shame on you and every citizen of Bodden Town who voted for you. A lot of expats here smoke and by default contribute a tonne of duty to the economy but if you drill down how many of that section of the community are a drain on the health care system i bet its tiny. So in which case do you ban smoking for Caymanians only…cos expats pay to support the system….but seldom are they here long enough to reap the reward so to speak. i would focus on getting the sedentary population out of cars and walking a bit more first, remove burger joints from school areas, stop the school bus dropping overweight kids off every 100 yards and reduce the price on healthy foods first. oh and seeing as most of our elected MLAs could do with loosing a few pounds……. Ozzie this is the best idea to solve cayman's financial woes? While you at it too, you should ban cow cods! Putin must have came here and had talks with you on how to implement a dictatorship country. I barely make ends meet in today's envorinment and this is your solution – ridiculous! While you're at it sir ! we cant breath from all the carbon monoxide emissions coming from that downtown traffic and the fumes from the Garbage Dump. So before you take away my pack of Rothmans fix me up with Some Clean Air. "Caymanians are still smoking hard" so ban it for them and let the tourist's and expat's carry on as normal otherwise this place will be a ghost town. How many tourist / tourist industry workers / financial industry workers would we lose? I seriously doubt it would be banned as that would be a huge loss of revenue for Govt. At last, a rational reason for not banning smoking in the Cayman Islands. I hope government takes careful note of it. Did you know that there are people who suffer from an auto-immune disorder called ulcerative colitis who use smoking tobacco medicinally? It is one of the only disorders where tobacco is prescribed and found to be more effective than other medicines. When tobacco is smoked, the heat acts as a catalyst to break down the nicotene into a mesalamine type complex which is absorbed and quickly reduces inflammation and bleeding in the colon. Other tobacco forms and patches have not been effective in the treatment of this disease. Oral mesalamine, 5 ASAs, other anti-inflammatory drugs, and steroids all have worse side effects and are less effective than smoking tobacco. All of this information can be verified by referrencing the many scholarly articles available on the topic and current research is still being conducted at John Hopkins and NIH. Cessation of smoking by someone with ulcerative colitis is a quick sentence to pain, bleeding, probably surgeries, and in some cases it has lead to fatalities. If a ban is put in place, which would take away the freedom of the people to make decisions for themselves in a poorly thought out move by an oppressive government, then I hope they would at least consider the residents of this country who rely on tobacco as a form of medicine. The liablilty of smokers is borne by government. Those who choose to smoke an kill themselves should not be assisted by the government. Some of the people who oppose a ban are CFS dependents. 13:50, perhaps those that choose not to work, eat junk food, don't wear subnblock, drink too much and are morbidly obese should not be assisted by Government? We will all be dead anyway in a few years from the Dump because yet again our Govenment have failed to do aything about it other than commission the 20th report on it. Totally ridiculous. Adults have the right to make their own choices. For the church or any other institution to think that they could possibly enforce a blanket ban on smoking are making a rod for their own back. Those in charge can't even enforce simple bans like no driving and using your phone or no darkly tinted windows and now you propose policing a ban on smoking. What a joke. Next you'll want to ban drinking or over weight people from fast food outlets. History has tried many times to enforce restrictions on peoples preferences and it never ends well. And by the way if the price of good quality fruit and veg wasn't so extortionate maybe people would eat more of it because as it stands its not affordable to many. Well, then they should foot their own medical bills. Excuse me – It wasn't 'the church" that suggested the ban on smoking, it was our illustrious Minister of Health. 19:52, maybe the Church asked Ozzie……. Well the church has had a total ban on logic, open minds, tolerance of difference, christian ethics so why not smoking. Now they also ban gambling except when money comes their way from gambling politicians. Although the smoking habit is repulsive to me, I strongly beleive that no government should be telling the general public how to live their lives. I am not saying that the ban on public smoking should be lifted. The general public does have a right to breathe clean air. However, by banning smoking completely, we would be allowing the government to dig its claws into our daily lives even deeper. Further, as adults, most of us have the reasonable intelligence to know that what we are consuming is either good or bad for us. I don't need the government for that. If the government really is so concerened about Caymanians' health, perhaps smokers and obese people should pay more for health insurance. Tax cigarettes heavily, but subsidise fresh fruit and vegetables, for example. What we need is less government intervention, not more. What's next? Compulsory church every Sunday? would you say the same about herion? Do they have legal basis for "some bold steps"? lmao lmao lmao i can't stop laughing…put a ban on smoking??? OMG they can't even enforce drinking and driving, seling of drugs, consuming of drugs, importation of firearms, now you think they can enforce a ban on smoking??? Oh yes, did i also say "unsolved murders or attempted murdersI think i shall continue lmao lmao lmao lmao this country is so full of putting laws, bans, etc into effect, but the biggest joke is non of them are enforced…. Get used to it and act accordingly. That cant apply the traffic laws, how in Gods name would be apply a total Cayman ban of cigarette smoking? Only a politiccian will make such an irresponsable statement. Public figures are to be careful because they will be held accountable. No democracy will ban smoking completely, why would you say something like that? are you so used to empty promises? somking is bad for your health and the ones around you, that is a fact, but so are a lot of other habits and/or substances that we all use. are you going to ban all of them? are you going to forbid diabetics to have childrens as a way to fight the disease? For a politician it was also really stupid. Lots of voters are smokers. Actually i think one has…Nica or somwhre like that, near New Zealand inthink but its such a small place who cares.. No normal country has ut a complete ban in place…but hey we aint normal ! it is not the norm in Cayman for politiciansto be held accountable, in fact quite the opposite. Apparently he did not mean to say this. However what is clear and has been proven a 100 times over in other jurisdictions is that if you ban something or make the taxes ridiculous, you just start a new industry in smuggling that product….given our porous borders..it will just mean lost taxes for the government and more profits for the gangs. Good thinking. When he says Caymanins are still smoking hard….is he referring to the ganja as well or just cigarettes?? Do not forget the smoking of crack cocaine. It would seem that we need to ban eating! Obeseity is our major heath issue. Hell, why don't we ban resaurants from serving breadfriut, dumplings, yam, potatos ect. Let's not even get into the prevelance of drug and alcohol use in Cayman. Mr. Minister it’s all fine to talk about it; however this is information that the average Caymanian has known for many years now. Why don’t we “DO” something about it for a change? Ministers make the laws, therefore if you choose not to make the right decisions for the country it’s on you. I hate smoking but even I can see that forcing the none use of smoking will lead to an underworld just like the use of drugs. That leads to more resources from government to deal with it. No the better way is to enforce the no smoking laws we have now and educate the public not to smoke. People still smoke at all the bars in Cayman that have and outside area, this is against the law but the bars ignore it and so do the police. Start with the government. I am sure there are civil servants smoking in the new Admin building, as there was int he old glass House, even after the law was passed. Civil servants face no liability- so theydo what they want? If you go this route – i personally will file a suit against you and the Cayman Islands Government. You need to fix the dump and stop trying to dictate to people how they should live. I'm from BT and i cant believe this is the kind of thing you wish to prioritize or even consider. Just who the hell do you think you are. Never will you get my vote again. Hello, another example of this "thumbs up for Dart" farce. This post is about as genuine as a nine bob note. I'll wager one hour's worth of recently reported slot machine spending (about $50K?) you aren't a Caymanian and you aren't from Bodden Town, so come off it and get back to cobbling together another wacko McCompass editorial for our continued amusement. Anything to distract us from the real issue! Get Dart to fix the dump now! It is the only viable option for the country and to ignore this offer is wilfull negligence on behalf of the Minister. You're flogging a dead horse, mate. Get real – the "Dart Solution" is as dead as a doornail and will never be implemented. It's a bitter pill to swallow, I realize, for all who are on the dart coolaid, but I do commend the droves around the globe who studiously vote thumbs up for anything concerning this particular company. It really is quite laughable. Ossie is right. Everybody know that prohibition works. That’s why no one is in Northward for weed. Does the Minister drink? Then perhaps alcohol should also bebanned as alcohol also kills!! ( being sarcastic). The banks and trust companies are already leaving, do we also want to kill the tourism industry!!! With that theory Mr. Bodden, I hope you will be banning Burger King, Wendy's, KFC and Popeye's as they are a clear player in the Country' obesity problem, you know that other problem that kills far more people, and causes far more health problems than smoking. Also, let's ban alcohol too and change from a Chrisitian country to an Islamic state. 827 I am ROTFL…..Thank you! Ozzie, ya hear dat? hush ya damn foolishness! Actually the Islamic Sharia laws are not too different from those listed in the Books of Leviticus and Esekiel in the Old testement, ie putiing money lenders, adulturers, disappointing children and lobster, turtle and conch eaters to death.